An Israeli PSA shows one more way Internet tools are reshaping the landscape of war. Over the past week, we've been tracking closely how Israel and Hamas are bringing the conduct of war into the Internet age. The latest example comes from this advisory, whipped up by an apparent civilian named Evyatar Tabib. The image urges Israelis not to tweet about the location of Gazan rocket landings for fear of giving Hamas information it can use to adjust its aim. The concern isn't unreasonable. While Israeli officials exercise firm control over what defense-related information makes it onto the airwaves via television and radio, there are no such restrictions on Internet content, according to Dr. Ilai Saltzman, the Schusterman Visiting Israeli Professor of Government at Claremont McKenna College and an adjunct professor of international relations at The Hebrew University of Jerusalem. With social media, Saltzman wrote in an email, "Ordinary people become self-made reporters and publicize their personal experiences [...] Like in the case of Lebanon in 2006, they help Hamas and Islamic Jihad to re-calibrate their missiles, rockets and mortars." 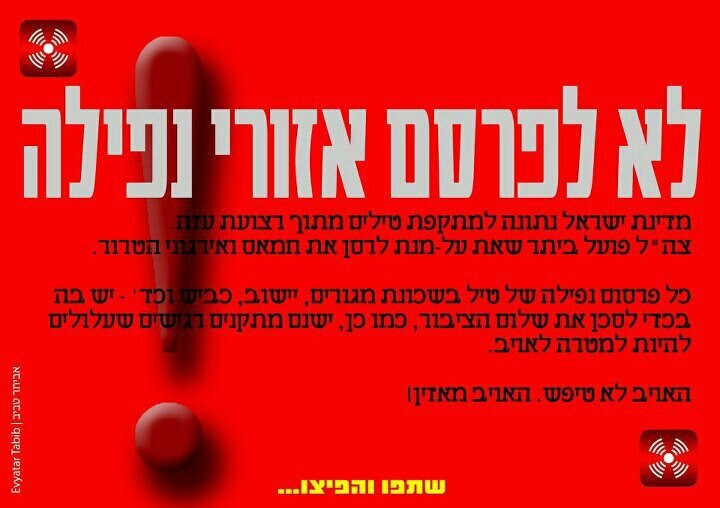 At 4:59 p.m. local time, NRG (the Maariv website) posted a breaking news update that stated the precise location of the rocket that hit Rishon LeZion -- I mean, down to the street name (I'm talking about the one in Rishon). Within minutes, though (5:04 p.m., I believe), it was changed to "somewhere in the Rishon LeZion area" and a few minutes later (5:22 p.m.) they posted another update stating that the rocket had not yet been found. They later posted updates confirming that a rocket hit in the area, but never did say -- or even hint -- where. Makes you wonder who made the call to change it. At one level, Tabib's illustrated message recalls that old World War II poster exhorting Allied civilians to silence -- or risk being responsible for a German U-boat's lucky shot. But Tabib's poster is more than a public service announcement. It's evidence for a new way of thinking about social media as a dual-use technology. "Dual-use" products are those can serve both peaceful and military ends. Consider civil nuclear programs: When a country uses nuclear technology peacefully, it produces tremendous amounts of clean energy that helps industry and society flourish. But in the wrong hands, civil nuclear reactors also enable the secret construction of nuclear weapons. Social media, it turns out, might be a lot like that. For all the increasingly familiar ways in which social media can be empowering, it's, like other technologies, not without its darker applications. Autocratic regimes, e.g., can use it to bait and hunt down dissidents; and armed groups, not just civilians, can find tactical uses. Digital tools like Twitter and Facebook aren't only valuable as a news service or as a way to coordinate emergency response or as a catalyst for collective action; used differently, they have the potential to make armies more deadly. It's unclear to what extent Israelis -- or news outlets, for that matter -- are heeding Tabib's warning. "People on Twitter are definitely posting locations of rockets when they know them or hear anything," Sharon Goldtzvik, an American whose husband Yonathan was born in Jerusalem, told me. "And again, I think the idea that it poses a risk is pretty absurd since the media is all over it anyway." For some Israelis, the urgency to report, and to coordinate medical or other aid, trumps the danger of giving Hamas targeting information it may not find very useful anyway. The group's rockets are so inaccurate, any sighting adjustment still carries the baseline risk of missing by wide margin. And if it truly needed spotters, couldn't Hamas employ its own? The use of social media as a command-and-control instrument may not be a key factor in this war. But that shouldn't keep us from recognizing the technology as a potential C2 tool for future wars.